The elop*9 cohort get to work at the Pontio Arts & Innovation Centre: Image credit: Wil PhilpinPsychology students at Bangor University are getting involved in an innovative international project which could provide creative new solutions for complex modern problems faced in Bangor, as well as by other communities. The six Bangor University students are contributing their combined knowledge of psychology, tourism and business to elop*, a project which brings students from different disciplines and countries together to pool their knowledge to resolve problems. Elop stands for “environment-focused learning and operative platform” and is a new approach to teaching that provides students with the skills and techniques for a dynamic career in a complex and challenging future. 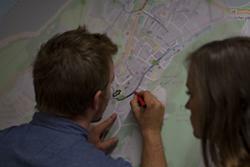 In this project, Ffordd Pawb / Coherent Connections, the students will be addressing real issues and assessing the shape of Bangor’s future, looking in particular at mobility, the sharing economy, tourism and new ideas about how services are provided. These ideas have been drawn from consultation with stakeholders including Gwynedd Council, the Welsh Government and, most importantly, the residents and businesses of Bangor. Some elop*9 team members working on a map of Bangor. : Image credit: Will Philpin“Today, our societies are faced with “wicked problems” - those complex challenges that seem impossible to address: obesity, climate change, and economic and social regeneration. The solution is to bring specialists from different areas together to combine their different perspectives and expertise into transdisciplinary teams. These groups then develop unique insight into the problem and produce innovative solutions that are co-created directly with the communities their ideas will affect. “Our students will be working on a real-world project that will consider the future of Bangor, developing proposals that could produce a lasting transformation to the prosperity of the city. The elop*9 project in Bangor runs for the next 3 months with a period of virtual collaboration in between physical meetings in Bangor in October 2016 and January 2017. 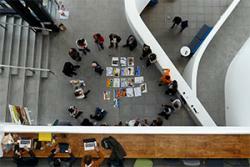 It is being held in the Pontio Innovation spaces as part of Arloesi Pontio Innovation.